Today, the most extreme aversive used with dogs is the electric shock collar. A shock collar works by administering a shock to the dog’s neck to stop a behavior (positive punishment) or continuously shocks the dog until they do the desired behavior (negative reinforcement). 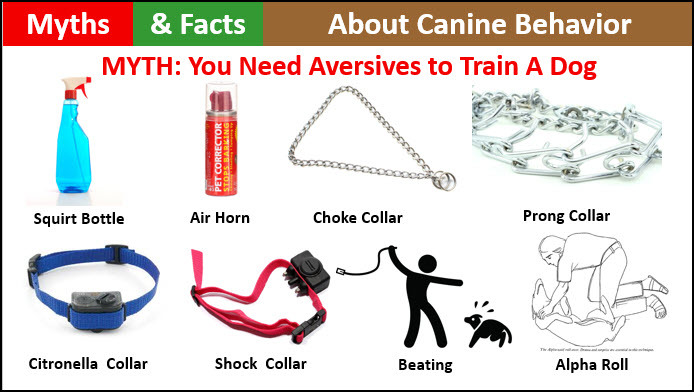 Shock collars are promoted for remote training, containment, and to stop barking. Some trainers even routinely recommend shock be used to train a puppy to sit. All objectives that a knowledgeable and skilled trainer or behavior consultant can achieve without the use of aversives. Why people choose to use a shock collar on a dog that is allegedly their best friend is a mystery to me. 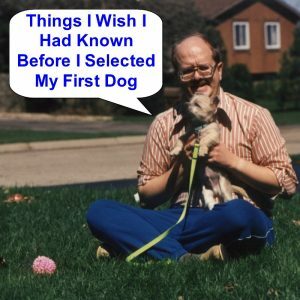 ( FMI – http://bit.ly/BestFriendsAndShock ) Based on experience with some of my clients I believe that they did not understand that the shock from a shock collar needs to hurt their dog to be effective. These individuals had been convinced to use a shock collar because they had been told it would allow their dog more freedom and then were appalled the first time their dog was shocked, and they heard her yelp in pain. They never used the shock collar again. Unfortunately, the marketing materials for shock products are not always clear about their aversive nature. 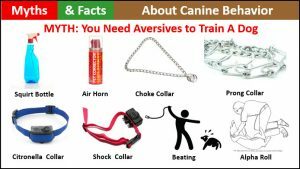 Why a canine professional would ever recommend any aversive, but especially a shock collar, is even more unsettling. It may be because they have elected not to keep learning. Veterinary behaviorist, Dr. Lisa Radosta noted in the 2017 documentary film Dogs, Cats, and Scapegoats: “If your trainer is still using pinch collars and choke collars they haven’t read a book or gone to a scientifically based seminar in 25 years.” That is why when choosing a dog training professional it is essential to make sure that they have been certified by an organization that mandates continuing education. ( FMI – http://bit.ly/HowToChooseADogTrainer ). What many people do not realize is that anything that makes your dog anxious, afraid or uncomfortable is an aversive, even if you did not intend for it to be aversive. For example, within days of adopting our current dog, Muppy, she was sitting on my lap for some snuggle time when I sneezed. Muppy bolted off of my lap and ran out of the room. When I found her she was trembling, her tail was tucked, her head was down, her mouth was closed, and she was avoiding eye contact. She did not feel comfortable approaching me until I got down on the floor, looking the other way, allowing her to decide if she wanted to approach. She eventually did, and we resumed snuggling, but she continued to react in this manner every time I sneezed for several months. We finally got past this, but it took a concerted effort on my part. I have had clients with dogs that have experienced a shock collar who will no longer enter an area where they received the shock. 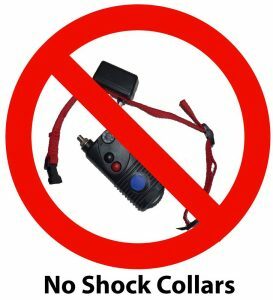 Others that have a panic attack anytime they hear something that is even remotely similar to the sound made by the shock collar. Some aggressively bark, growl, and lunge at any child because that is what they were focused on when they received the shock. I know I could never put a dog through that, especially knowing that it is NEVER necessary. https://www.shockfree.org/ and https://www.facebook.com/shockfreecoalition/. The Shock-Free Coalition is an international project and we value your support no matter where you live.